Reboot. It’s a word that gets thrown around a lot nowadays, heck even the beloved 90’s animated series Reboot is getting…umm….rebooted, and to many it’s as dirty a word as the most well-known four letter ones. For every great reinterpreting of a property, like Christopher Nolan’s The Dark Knight trilogy, you get a Point Break, Total Recall, Terminator: Genisys, or RoboCop that fail to capture exactly why properties such as the ones mentioned became such beloved classics in the first place. In 2008 Disney of all people, before the days of owning the likes of Marvel and Star Wars, along with newly formed Vancouver studio Propaganda Games set to relaunch the Turok franchise that lied dormant after Acclaim closed it doors in late 2004. A good reboot uses the source material as a foundation in which to build something new and modern. The only thing that Disney and Propaganda took from the original game is the title, dinosaurs, and little else. Though this game is called Turok, it’s just another Gears of War wannabe that fails to capture anything of what made the original N64 trilogy so great that it helped save a company. In Turok you play as…sigh…Joseph Turok, a former member of black ops military outfit called Wolf Pack that Turok left after he disapproved of the brutal methods of the mercenaries. Members of Wolf Pack led by their leader, General Roland Kane, have gone rogue and taken refuge in a plant on the outer fringes of the galaxy. Turok, along with yet another band of soldiers known as Whiskey Company, are tasked with bringing Kane to justice, but after their transport ship crashes, Whiskey Company find themselves in a desperate fight for survival against not only Wolf Pack, but from prehistoric predators that have been long since extinct for millions of years. 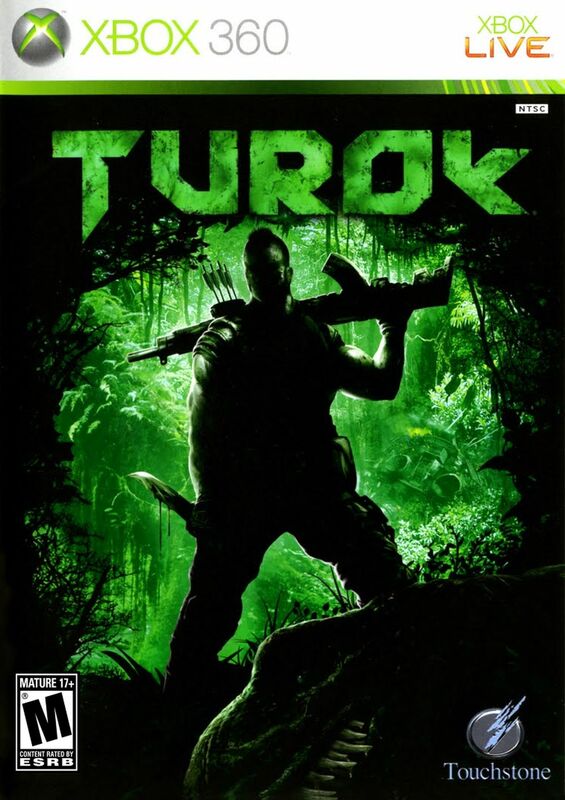 The problems with this reimagining of Acclaim’s Turok franchise start, at least with me, with the fact that the name of the title character is Joseph Turok. When I read this on the game’s packaging, it made me laugh out loud because it reads like the bad 80’s Masters of the Universe or the 90’s The Punisher where a studio would just buy an IP with little to no understanding of it, other than that they would sell something on the name alone. That was kinda acceptable back then, as unfortunately it was the norm as opposed to the exception, but not in the late 00’s. Having honestly not read a Turok comic, but at least looking into as to not be completely ignorant, I’m well aware that Acclaim’s take on the Turok character was a radical departure from the classic stories about the character, but at least they made the character seem important. In Acclaim’s games, the title of “Turok” was integral to the fiction and the world. Whoever took on the mantle, whether it was Tal’Set in Dinosaur Hunter and Evolution; Joshua Fireseed in Turok 2: Seeds of Evil or the brother and sister duo of Danielle and Joseph in chapter three, the world could not be saved without a Turok, but in the 2008 game, you’re just a guy who happens to be named Turok. That’s like if they decided to make a new Batman who was some guy that was named John Batmen. The issues don’t end with the silly name, but from how uninventive the other characters and story are . You’re introduced to Whiskey Company as they exit their hyperspace pods like something straight out of James Cameron’s Aliens and this homage extends to you being stranded on an unknown world with monsters as well. The characters themselves are your stereotypical big-chested, broad-shouldered space marines that look like they didn’t make the cut for Delta squad in Gears of War and are forced to slum it here, and the same goes for the human enemies. 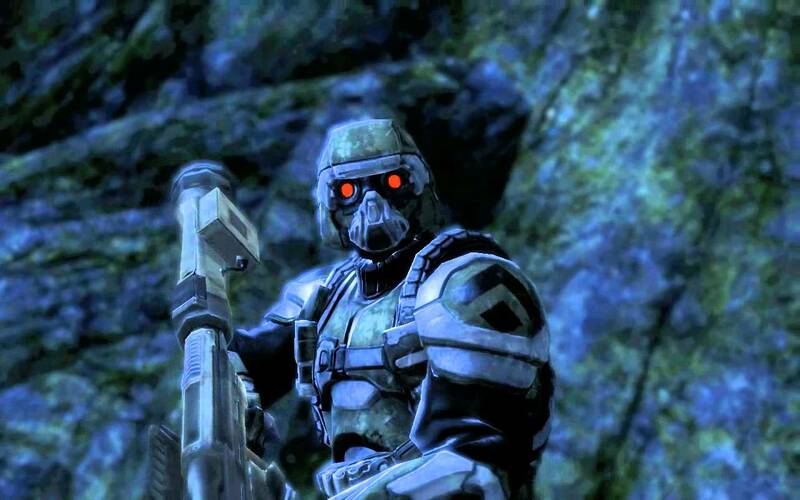 They’re draped in black with red goggles, gas masks and helmets exactly like the Helghast in Sony’s Killzone series. The story that threads the fifteen chapter, eight-to-nine hour campaign is just as uninspired as the characters, and by the end I couldn’t even remember why I was tasked with hunting down Kane and his Wolf Pack to begin with. Some eleventh hour plot elements are thrown in about a gas as well as monsters bugs found on the planet, but by then you don’t really care and just want the game to end. Making all this worse is that this game boasts a lot of great voice talent. Ron Perlman plays your untrusting comrade who spends most of the game by your side; The main villain is voiced by Powers Boothe and the rest of Whiskey Company is filled out by the likes to Donnie Whalberg, Timothy Olyphant and William Fichtner. No matter who’s talking though, a character is either annoying (Perlman), having their lines phoned like in the case of Olyphant who sounds very, very bored or unrecognizable. I pride myself in having a good ear for voice actors, but I didn’t know either Wahlberg or Fichtner were even in the game until the closing credits. As I’ve said in many a review, a poor story can be forgiven or looked past provided a game is still fun to play, and Turok is…pretty mediocre. The N64 Turok games were known for their giant, expansive levels that required you to explore a lot of honestly overwhelming environments. Here you’re funneled through a set path, running from shoot out to shoot out, occasionally fighting a boss character either in the form of a giant dinosaur, monster, helicopter or tank. The guns feel good and powerful as you’re controller shakes in your hand when you pull down the trigger, however aiming them is another story completely. I can’t remember the last time I played a first-person shooter where I’ve had to tweak the aiming so much, and still never feel like I can quite line up an accurate shot. 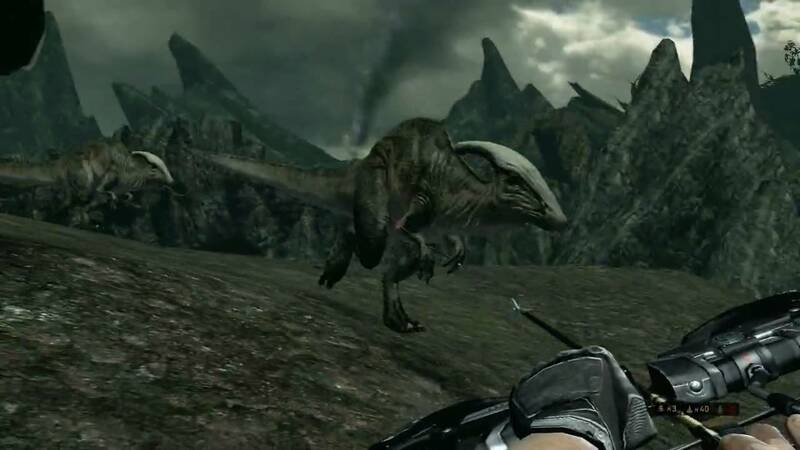 This makes the game realistic in a sense, but in a game where I’m an alien planet fighting dinosaurs, some liberty can be taken with exactly how heavy a gun should feel. Not helping matters is the amount of shaking that goes on in the game, so much that a more accurate title would’ve perhaps been Shake. When you’re moving, the camera is shaking, same as when you’re aiming or taking damage. My most hated use of this is when you take explosive damage or are knocked back by a large dinosaur. You’re character will realistically fall down, throwing off your sense of direction entirely and getting you killed in some of the most frustrating sections of the game. I spent over an hour at one point replaying a section over and over as I tackled an annoyingly placed soldier with an RPG. I’d finally wrestle with the aiming controls, only to get shot, knocked down, forget where I am, and then sent back to a checkpoint. The weapons are arguably what people remember most about the original Turok franchise, things the cerebral bore that ate through an enemies skull all the while making an awful screeching sound or the nuke that created a devastating explosion that not only cleared away enemies, but knocked down parts of the environment as well. This time around no such creativity went into the available arsenal with your weapons mostly consisting of genre staples like a shotgun, an assault rifle, a pulse rifle, RPG, etc. The weapon most associated with the Turok franchise that makes an appearance here is the bow and arrow, which I found to be absolutely useless. It’s meant for stealth kills by silently catching enemies off guard, but the aiming is so bad that bad guys more or less have to be standing completely still in order to hit them with an arrow. Most of the time once you take out one enemy this way the whole squad is alerted to your presence anyhow, so it’s always best to lead with a more modern weapon. Turok breaks up its fire-fights with generic bad buys by throwing dinosaurs into the mix, but what should be fearsome predators are mild annoyances most of the time. You have a second weapon always on hand for stealth kills, a knife, that when equipped will allow you to perform take-down maneuvers provided you can successfully sneak up on an enemy by hitting the right trigger when prompted to. I never used this weapon for that intended purpose however, and equipped it mainly to kill dinosaurs. As opposed to wasting bullets shooting them, I’d equip my knife, wait for a prompt, and then take them down with one hit. This tactic worked a good eighty percent of the time and it really diminished the threat these giant creatures should have created. This of course didn’t work on species like the T-Rex, but animals of that size only show up periodically. If I had to say anything positive about Turok is that despite its overly linear level design, the environments themselves are pleasant to look at. You’ll spend missions fumbling about uninteresting bases and facilities, but a lot of the game is spent in outdoor environments made up by lush, green jungle. Outside of the title character, this is perhaps the only other way this game feels like a successor to the Turok series. For the hard time I’ve given this game for it ripping off of other popular shooters that were released at the time, I very much appreciated not having to stare at a drab brown and grey colour palette. 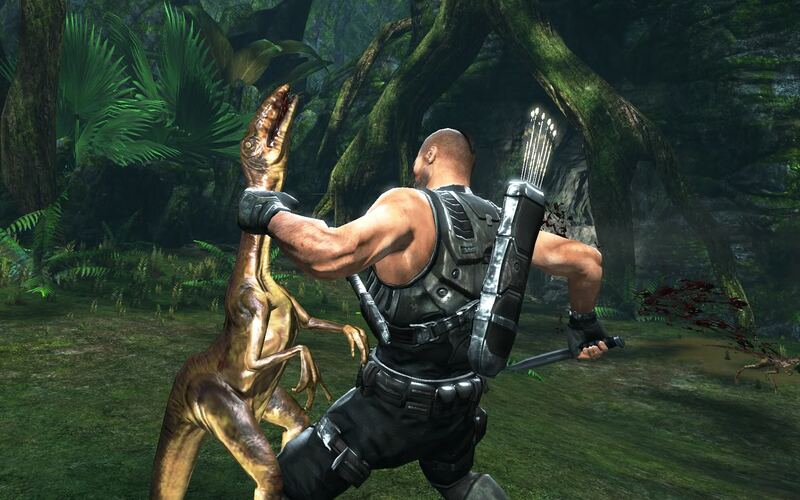 Turok (2008) is a prime example of how not to do a franchise reboot. Take away the title and renaming the main character, this could easily be just another first-person shooter that happens to have dinosaurs. There’s nothing about this game, from the weapons, the linear level design to even the main character that make it feel like a successor to the Acclaim games of the same name. Even as a first-person shooter, it doesn’t do anything interesting that other games even at the time weren’t already doing, and the controls for aiming don’t even make the act of shooting feel fun. I’m sure there’s a way to bring back Turok for modern audiences, but this game sure isn’t it.